The second museum I visited during Museumnacht 2016 was the Van Gogh Museum. It was my first time there so I did not know what to expect. The Van Gogh is a different museum. While it focuses on Van Gogh it makes the experience of looking at his works very personal. The first part of the exhibition is the picture above. 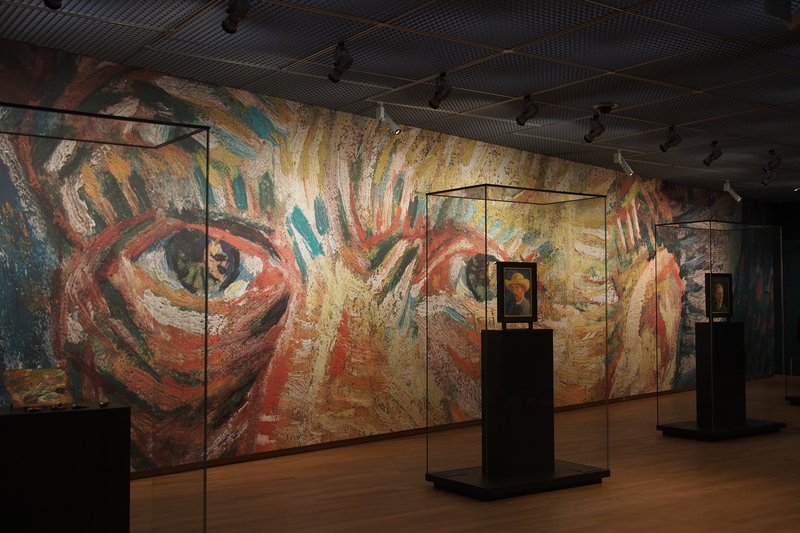 A wall with his eyes looks at you, you are in Van Gogh’s world of colour and life. There is on thing I have to remark about this museum. The Van Gogh museum is lovely and really shows off the art and culture of Van Gogh and his peers. You are invited to share on social media that you are there and others should come too. But taking a picture with a camera, well that leads to security warning you. I entered the museum with a camera in my hand and no one of the staff told me I could not take pictures. After taking a few pictures with my camera (no flash) a grumpy security guard comes to me and tells me taking pictures is forbidden. Okay, I put the camera away. Then I notice people using smart phones to take pictures, no security guards approach them. I later asked another security guard about this no pictures policy and I was told that pictures are actually not allowed. Sometimes though they ignore it. I thanked him for the explanation and was about to leave. Inviting visitors to share their presence on social media but no allowing pictures, is the Van Gogh Museum stupid? I like the museum but that policy is terrible. I could only take a few pictures because of this policy. When you visit this museum ask if pictures are allowed. If not consider whether the visit is worth it. Posted in Photos and tagged 2016, Amsterdam, art, culture, Museumnacht, people, Van Gogh, Van Gogh Museum on November 11, 2016 by rura88.